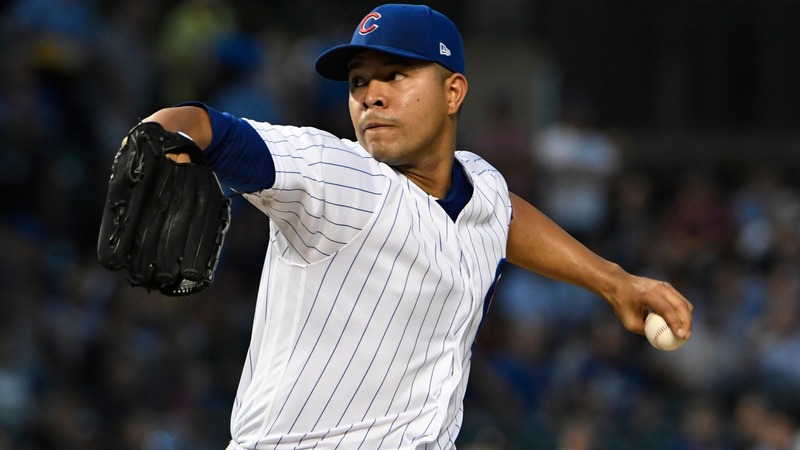 Jose Quintana is back at Guaranteed Rate Field Friday as he attempts to surpass his career-high win total against his former team. Jose Quintana is back at Guaranteed Rate Field Friday as he attempts to surpass his career-high win total against his former team. Quintana made 82 starts on the South Side before getting traded to the Cubs last season but he's never reached 14 wins in a season. Could Friday be the day as the Cubs open a three-game series against their crosstown rivals? Oddsmakers say yes as they posted the Cubs as the -180 favorite. __MORE:__ [Who should be on Cubs postseason roster? ](https://www.betchicago.com/cubs-postseason-roster-david-bote-addison-russell) ## [Odds: Cubs (89-63) -185 at White Sox (60-92) +170; Total: 9](https://www.betchicago.com/mlb-betting/coverage/c74d50e9-5ecf-4577-abe5-0a5804070a19) __Pitching preview:__ Cubs LHP Jose Quintana (13-10, 3.95 ERA; 4.33 xFIP) vs. White Sox RHP Reynaldo Lopez (6-9, 4.05 ERA; 5.27 xFIP) Quintana has allowed two or fewer runs in six straight turns, good for a 2.10 ERA during that span. Quintana, who has a 3.59 ERA in 84 games (82 starts) in Guaranteed Rate Field, has seen the total go UNDER in five of his past six road starts. He'll need to be careful with Yoan Moncada, who is hitting .333 with four RBIs over his last 11 games and Daniel Palka (7 HRs in last 15 games). The White Sox are 5-1 in Lopez's last six starts as the right-hander owns a 0.45 ERA in September. While he's been solid, Lopez's xFIP has been at 4.0 or above in three of his past four starts. The advanced stat jumps to 5.59 at home against left-handed batters which could spell trouble against Anthony Rizzo. __Play and win:__ [Crosstown Classic Challenge](https://betchicago.chalkline.com/games/cubs-whitesox-mlb?external_referrer=https%3A%2F%2Fwww.betchicago.com%2F) __Trends:__ Cubs are 8-2 in their last 10 vs. American League Central. UNDER is 8-2 in Cubs last 10 overall. UNDER is 6-1 in White Sox's last seven games vs. a left-handed starter. Cubs are 5-1 in the last six meetings.